A fruitful economic strategy for water utilities! ■ Thursday 16 April, 10:00-11:30 - "French Pavilion"
Invitation "Education and Training Sessions"
It was adopted, on December 12th of 2009 by the Bureau of the International Network of Water Training Centers, at the home office of the International Water and Sanitation Institute of ONEP in Rabat - Morocco. Why an International Network of Water Training Centers? 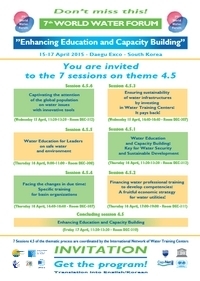 The AquaForMed network will attend the 7th World Water Forum, 12-17 April 2015, in Daegu & Gyeongbuk (South Korea). Discover the Mediterranean Network of Water Training Centers : www.aquaformed.org. You may consult the Charter of the International Network of Water Training Centres and the composition of its Bureau, by connecting you to the INWTC website. How to become a member of the INWTC? The INWTC is above all defined as being a place for thought and exchanges open to all the people in charge of vocational training on water INWTC Membership is thus based on the principle of a voluntary commitment of its members to promote training methods allowing the improvement of knowledge and know-how of the staffs of the water and sanitation sector, while adapting them to the different local situations. To become a member of the network, you can download the constitutive Charter of the INWTC, available on the website www.inwtc.org and send it to its secretariat at the following address : contact@inwtc.org.